This fish entree is great for summer because it is light but super flavorful in warm weather. It was inspired by a ceviche recipe, where the citrus cooks the fish to make it really tender. Instead of using the acidity of the fruit for the entire cooking process, the fruit is draped over the fruit like a blanket to cover it while it cooks. This makes the fish flavorful and tender. Red Snapper is a very mild fish that tastes slightly sweet and not fishy at all. It has a meaty texture and isn’t very flakey; ideal for an entree portion. 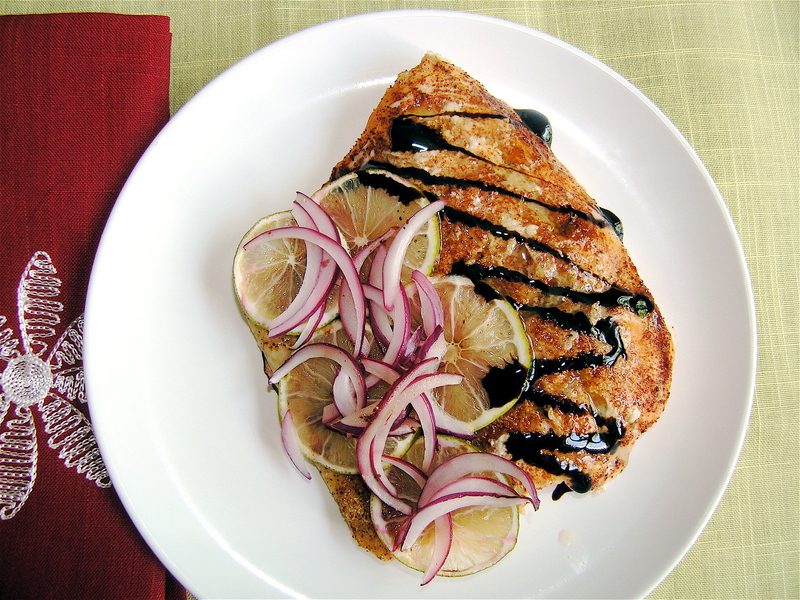 The natural sweetness of the fish is complemented by the balsamic glaze and crisp citrus notes while it bakes. Serve it along side white rice for a quick and rather effortless dinner. In a small bowl combine the red onion, garlic, honey, cayenne, cumin, 2 tbs balsamic, and the juice from 1/2 of the orange. Whisk well to combine. Thinly slice the lime, lemon, and the remaining half orange so that you have formed disks of each of the fruits. Arrange the fruits on top of the fish like a quilt, alternating the type of fruit. You want the fruit to form a little blanket over each piece. Bake in the oven for approximately 12 minutes, or until the middle and thickest parts of the fish are mostly firm and opaque. Remove the fruits (you can serve them as a garnish like I have) and drizzle with more balsamic glaze if you wish.